correcting sequencing for a smooth, unbroken flow in the text. 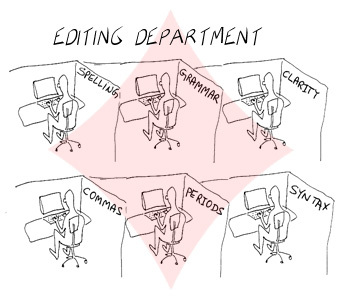 In fact, an editor's job is to make the text perfect. We can not only edit your original source text to make it perfect grammatically, stylistically and technically but can fine-tune the lingo to your target audience whether in the US or abroad. Editors are native to the original language and experts in your particular subject field, from high finance to technical and/or legal, from jazzy advertising to jazzy music, from multilingual Web sites to multipurpose pharmaceutical instructions. Let us help you look good all over the world!